It’s been a year since we came back to Senegal to live. A date on the calendar, August 12th, tells me practically that this time has passed, but I perceive it more in the details of our ordinary life: the length of Sunny’s hair, the height of the banana trees in our yard, the changing light of a season returning with it’s own frank announcements– the rain, humidity thick on the skin, green, everywhere, green soothing over the fissures of a typically parched land. The scent of mangoes, hanging heavily from trees along the roads, tells me the rainy season has circled back around. Mangoes the size of a child’s forearm, with the fluid aftertaste of coconut and pineapple. They are plentiful and cheap and find their way into almost all of our meals. I frequent the fish market, which once terrified me, with its long, crowded, narrow allies, navigating through rain puddles, blood-soaked ice crates, discarded heads and scales, tangled fishing line with shards of lures. I am no longer shocked by the potent, briny smell, the din of loud bargaining over waves crashing into the port just beyond, shouting over tables, fish passed over heads, flapping sea water. Who has carp? “Madame Americaine,” someone is tugging at my sleeve, “come, come, urchin, monkfish, carp, pas cher.” Women crouched on low, rickety wooden stools, expertly gut and fillet my fish before I can count out the now familiar papery bills. I pick out the coins, recognizing them by color and weight. 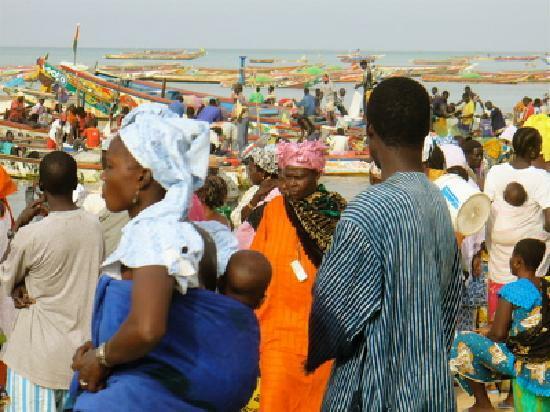 I thank the vendor in Wolof and move out from under the rusted tin roof into the hot sun, pushing past on comers and barefoot children selling plastic bags. It is my last stop before the bakery to get bread and my canvas bag is now heavy. This has become a familiar, natural routine. I don’t think much about our surroundings, our daily lives, and this also tells me that a good deal of time has passed, that our lives have settled upon us. Then there are the subtle negatives of absorbing time. The talibes, the young boys who beg for alms and food to pay for their religious education–when did they stop tugging at my heart and become a common detail in my day? At what point did I begin to regard the many sellers who approach me with their wares as a nuisance? It takes a year. Many people have taught me things this year and I have met some extraordinary individuals. Aminata is one of them. She is in her early fifties, tall and broad shouldered, with braids woven tightly to her head. She was raised in a small Peul village, in a one-room hut with a straw roof, no electricity and no running water. The Peul are nomads, and one of the poorest tribes in Senegal. The men are shepherds, raising and selling sheep and cattle and the women keep the village. Aminata’s job as a young girl, in addition to tending the morning fire at the center of their hut and sweeping the dirt floor, was to fetch water at a well over two miles from her small village. She would walk with several other girls on the same path every day, an empty plastic bucket on her head on the way there and a heavy sloshing burden on the way back. They could not afford to waste any of the precious water, so the return trip took much longer, with careful steps and watchful eyes straining to detect obstacles, necks balancing the buckets, aided only by a small piece of cloth flattened on their heads to soften the load. As the years went by, Aminata began venturing further and further away from her village and beyond the well, until one day she reached the shore and spotted, there in the port, a sailboat. She visited the port almost daily from then on and watched how the boat’s owner cared for the deck and wrapped the sails, how the boat rocked and bobbed with the tides, swayed and calmed with the changing winds. She already knew how the water in her bucket reacted to the movements of her body and she became fascinated by both the principle of buoyancy and the idea of conducting herself towards a new land. She decided she would one day set sail on such a boat. But she was carried away on the current of her own life and cultural restraints and was married off at a young age to a man she didn’t love and had two children. Still, whenever she had the chance, she would steal away to the port to watch and dream. Not having been educated, she began to teach herself how to read, write and speak French in secret. These would come in handy, along with her other life skills, when one day, years later, she would no longer deny her calling. She took her children, who were now older, to her mother, left her husband and talked her way aboard a large sailboat as a volunteer crew member. She had observed and asked questions, watched and listened over the years and she sounded knowledgeable enough to qualify. She ended up, over the years, becoming an expert navigator and charter, who has sailed around the world twice and is a seasoned traveller. She met her second husband, a Frenchman and avid sailor in the port of New Caledonia and they divide their time between Senegal, Morocco and France. As she says, “I am, after all, a nomad at heart.” After I admired her coffee one day, she took me to the outdoor market the next morning, where we purchased raw beans from the Cote D’Ivoire, showed me how to sift and resift them in order to extract small pebbles and other debris and demonstrated how to slow roast the beans myself. They double in size as they swell and darken in the pan and give off an odor when they are freshly ground that puts Starbucks to shame. She also taught me to make pizza crust, Moroccan flat bread with rosemary and sea salt or stuffed with garlic, parsley and cumin. I learned from her how to tie a simple sarong in ten different ways and how to roll off several authentic phrases in Wolof that would get me in or out of any situation, depending on my objective. But mostly, I learned from her story about the shear power of the human spirit and it’s need to be free. And about persistence and not giving up. She wants me to teach her English when she returns from France, which will be for me a great pleasure indeed. It has been a trying year for us, as it has been, to varying degrees, for most people I know. For our part, our efforts to overcome the “crisis” became less about economizing than learning how to do more things for ourselves, becoming more independent. We built a house with mud, erected a wind-turbine to produce our energy and brought our water from the ground well with a hand-pump. This all now seems natural to me as well, although it took some getting used to and the path to where we are now has not been without it’s obstacles. 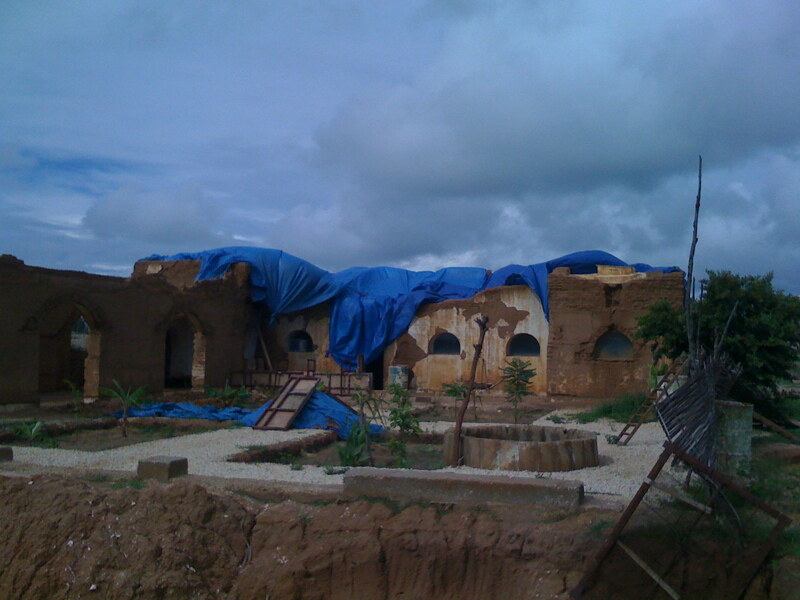 When we returned from the states on August 12th of last year, we found our house in near ruin. The previous six months of hard labor, ingenuity and creativity on Richard’s part had left us convinced that we needed to make a bigger commitment to Senegal, so we went back to the US to put our things in storage and rent our house in Savannah. We had received phone calls that the rain had done “some damage”, but none of the people we had left in charge were honest enough to relay the extent or send us photos, which in hind-sight was probably a good thing–if we had known, we may have abandoned the project. Now we found ourselves back in Senegal with very little money and no house to live in. I cried and felt the ruin deeply, while Richard began drawings to fix the house and work with what was left. We destroyed the entirety of the first vaulted roof because we were unsure of its stability. 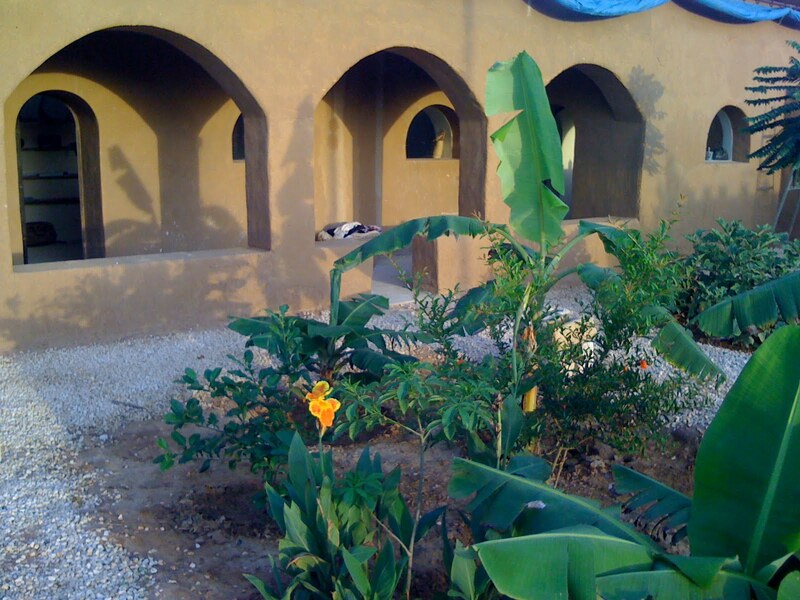 Next Richard constructed a pitched roof with palm beams and a plaster of mud, straw and Lyme, which we then planned to cover with metal roofing. During this part of the reconstruction, we planted an organic garden, erected the wind-turbine and went back and forth to our shabby hotel where our gated window faced the beach . . . and the fishermen’s tables where the day’s catch lay in the sweltering heat to dry. When we finally moved into the earth house, we realized within the week that we had not been sold palmwood, but datewood, which is much less expensive . . . and prone to termites. Our second roof was infested and needed to be torn down–it was beyond treatment. We had lost money, time and labor and worst of all, had been cheated by the wood vendor who vaporized as quickly as his beams. Once again, I felt we had been cheated. I asked why us, why now, how to move forward ? I posed these questions to no one in particular as my faith had been challenged and it appeared that no one was listening anyway. Was this how other people, whose lives had been upturned, felt in the void? While I examined and analyzed our lives, turning to look at every angle of every decision, trying to pinpoint the precise moment when the universe sent us spinning into orbit (or did we do that ourselves? ), searching for the axis on which we could set it all right, Richard was busy researching our third, and final roof option. Persistence. Determination. We decided that a flat, cement roof would provide the best protection, and although not in keeping with the ecological spirit of the house, would be solid and durable. In order to compensate for using cement, we would cultivate on top of the roof, which would both expand our garden capacity, create a micro-climate to cool the house and provide a roof terrace from which we could appreciate the view of the nearby lagoon and baobab trees. We spent months eating our own vegetables, my homemade pizza and watching our finances dwindle to a halt, while continuing construction on a shoestring, with only two helpers. Richard spent weeks working unfathomable hours in order to put a roof over our heads before the rain came. During this time, many people began to visit our project, both Senegalese and expats, and ask questions, which we hoped would lead to more work for Richard. In the meantime, our children blossomed and so did their knowledge of gardening, French, Wolof and human relations in general. We had succeeded in building a self-sustaining life, with no bills and limited expenses. But, knowing that the money would eventually run out and the rain would inevitably come, had left us feeling anxious despite our accomplishments. I decided to stop asking questions and breathe, work, allow a little faith back in. In the second week of July, the night after the last roof was finished, the skies darkened and it rained. Richard and I didn’t sleep that night, worrying about the earth walls and how they would stand up to the wind-driven storm, about whether the new roof was well-sealed. Morning sun showed us that our third and final roof was the right choice, as a full house inspection gave no signs of weakness. The following week, Richard was hired to build three more ecological houses. Contracts were signed and deposits were given. We were under consideration for a grant to produce three wind-turbines for remote villages without electricity, those like Aminata’s. We went out to dinner, the four of us, and clinked juice cups to wine glasses as we listened overhead to the storm clouds releasing thunder and lighting and more rain. Since then, we have continued construction between rain falls while Richard has juggled his other projects, planted new crops and rejoiced in our current good fortune. We are among the few expats who chose to stay during the rainy season, which is considered the least desirable. For us, it has been a time of warm ocean waves and rare walks through high, green grasses, of cups of afternoon mint tea shared with Senegalese friends, of pelicans, flamingos and heron migrating to the lagoon, of lingering visits to artisan workshops, where the purchase of one beaded necklace threaded with a single shell can satisfy a little girl and the artist equally. The morning of August 12th, Abdou, my favorite of the building team, came over to shake my hand as he always does. He is short and child-like, with bright eyes and broken front teeth which only exaggerate his smile. He is from Guinea-Bissau and has come to Senegal to work in order to send money back to his family. “Abdou,” I said, “today is August 12th. It’s a very important day.” “Yes,” he replied. “Today is the beginning of Ramadan, a time for fasting and contemplation.” I felt embarrassed that I had forgotten this. “It is also one year today that we returned to find our house destroyed,” I said. “Look at what you’ve accomplished. Look at what we’ve done together.” He looked over my shoulder and studied the house, but all he said was “oh,” as though he too had forgotten something important. He had not let go of my hand since he shook it. We were both aware of this, but it felt appropriate. After a few moments, he smiled at me, looked up at the sky and gestured towards a room half-finished. Then he dropped my hand to begin his day, this very important day. ← Can We Please Go Back?